ZZB-120A automatic cone drinking paper cup curling machine is manufactured exclusively by Lifeng under Patent No. 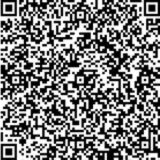 ZL 2007 2 0191331.3. 1. 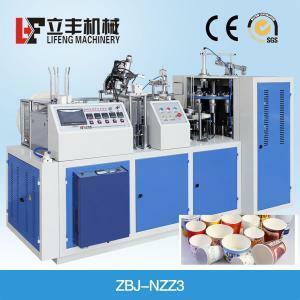 The ZZB-120A automatic cone drinking paper cup curling machine curls the water cone cups. 2. The machine automatically dispenses the cone cup, curl and collect finished cup. 3. Our machine is equipped with a micro-computer controlled system to adjust speed. 4. Our machine is equipped with an automatic photoelectric alarm system. 5. The ZZB-120Aautomatic cone drinking cup curling machine is certified by CE approval. 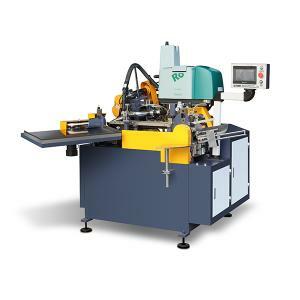 The ZZB-120A automatic cone drinking paper cup curling machine is used to make various types of cone cup containers, i.e., disposable water cups. 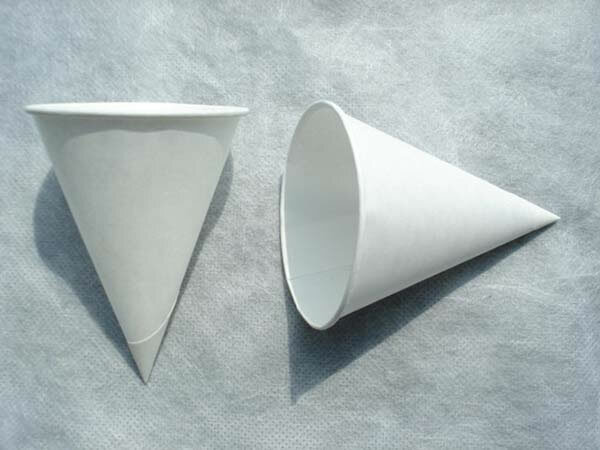 The water cone cup is gaining popularity worldwide and is widely used in airports, public places, etc. 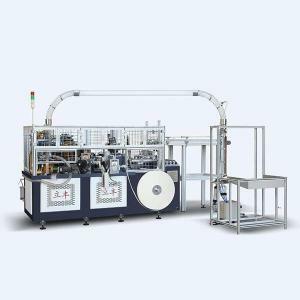 The frame of automatic cone drinking paper cup curling machine is made of metal and the body is made of steel. 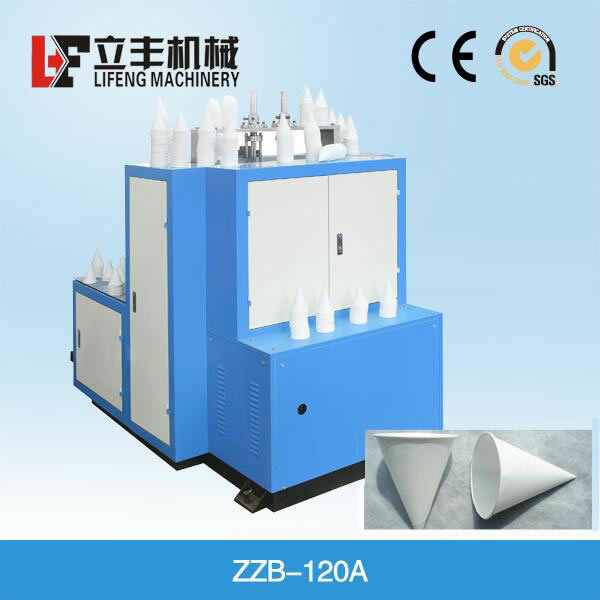 Maintenance on the ZZB-120A automatic cone drinking paper cup curling machine should only be carried out under supervision. Strict attention should be given while the machine is in operation and the shield is removed. 2. Attention should be paid to the sanitation and cleanliness of the machine. A fixed scheduled should be maintained to clear and wipe down the machine. Keep greasy dirt away from the paper, die and roller. The automatic cone drinking paper cup curling machine should be located away from paper scraps, dust accumulation or plastic rolling. 1. The ZZB-120A automatic cone drinking paper cup curling machine is adjusted one week prior to delivery to make sure our Lifeng machine is in perfect condition. 3. 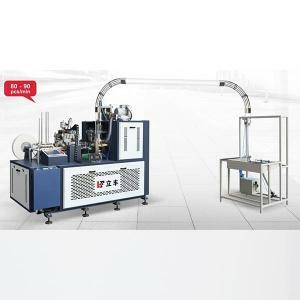 Free training is available and ongoing for the buyer until he fully understands the operation of our Lifeng automatic cone drinking paper cup curling machine. The buyer would be responsible for airfare and accommodations expenses. 1. Lifeng automatic cone drinking paper cup curling machine offers a one year warranty from the shipment date.